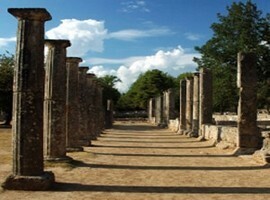 Although secluded near the west coast of the Peloponnese, Olympia became the most important religious and athletic center. Here were born the greatest games of ancient Greece, the Olympics, which was held every four years in honor of Zeus, an institution with nationwide radiation and glare from ancient times to today. 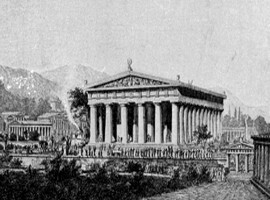 The origin of the cult and the mythical confrontations that took place in Olympia lost in the mists of time. 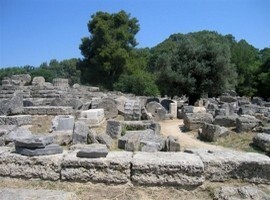 Olympia is the one of the most historical sites in Greece. 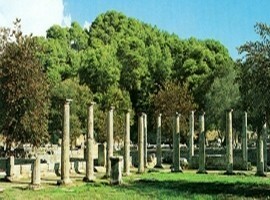 Olympia is the site of the first Olympic Games which were held in 776 BC. . In times of peace and war, the Greeks would compete for a crown wreath made of olive leaves. The Olympic Museum housing such ancient sports artifacts including bronze athletes’ discuses; bronze strigils used by athletes to scrape the oil and dust off their bodies; and halters, stone or lead weights held by jumpers for greater momentum. Your guide will take you to the remains of the Hippodrome and to the ancient stadium where the Olympic Games once took place. Here you will be able to visualize the Olympiads competing, in all their glory, against the best athletes the known world had to offer. A trip further to the west will introduce you to the sanctuary of Altis. This grouping of buildings are amongst the most admired in Greece, and a trip to the inner, sacred enclosure will introduce you to the temples of Hera and Zeus. 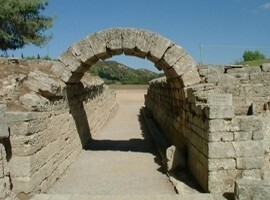 It is here that you will discover the altar where sacrifices were made to the ancient gods. Inside the museum, you will find some of the most incredible sculptures Greece has to offer, including a spectacular bronze collection. 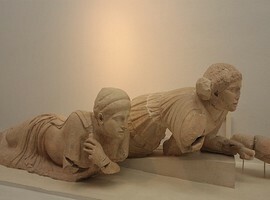 Also on show, are the two pediments from the Temple of Zeus, which date back to the fifth century BC and are one of the best surviving examples of Greek works of art from this period. 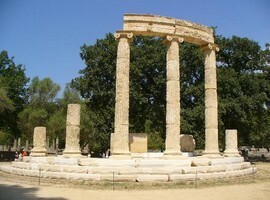 The sanctuary, known as the Altis, consists of an unordered arrangement of various buildings. 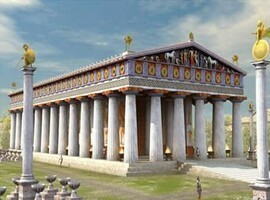 Enclosed within the temenos (sacred enclosure) are the Temple of Hera (or Heraion/Heraeum) and Temple of Zeus, the Pelopion and the area of the altar, where the sacrifices were made. 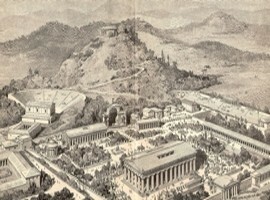 The hippodrome and later stadium were also to the east. 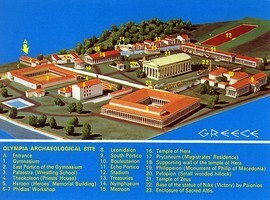 To the north of the sanctuary the Prytaneion and the Philippeion can be found, as well as the array of treasuries representing the various city states. The Metroon lies to the south of these treasuries, with the Echo Stoa to the East. 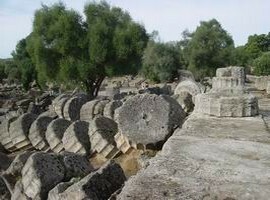 To the south of the sanctuary is the South Stoa and the Bouleuterion, whereas the West side houses the Palaestra, the workshop of Pheidias, the Gymnasion and the Leonidaion. 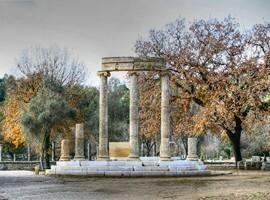 Olympia is also known for the gigantic ivory and gold statue of Zeus that used to stand there, sculpted by Pheidias, which was named one of the Seven Wonders of the Ancient World by Antipater of Sidon. Very close to the Temple of Zeus which housed this statue. The Kladeos, a tributary of the Alfeios, flows around the area. 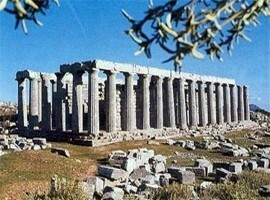 Its located in the part of Greece which is called Peloponesse. 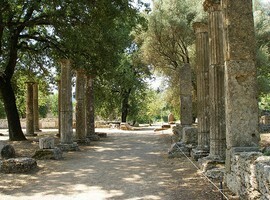 In Ancient Greece, Olympia was sacred ground to the Greeks. 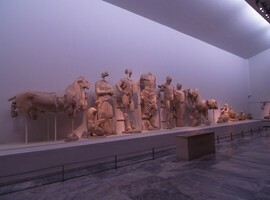 The Archaeological Museum of Olympia, the most important in Greece, presents a long historic development of the most splendid temples of antiquity, which was dedicated to the father of gods and men, Zeus, and was the birthplace of the Olympic Games. 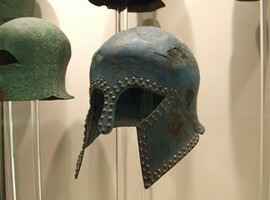 It includes a permanent exhibition of finds from excavations in the sacred precinct of the Altis.